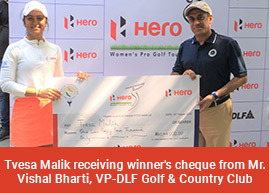 Gurgaon, March 23: Neha Tripathi capped an amazing week with a third successive sub-par round that gave her one of the biggest wins in the history of the Hero Women’s Pro Golf Tour. A final round of three-under 69 with four birdies against one bogey, all on the back nine, gave her a week’s total of 16-under 200. Amateur Ridhima Dilawari turned in a fine result finishing fifth with a round of 1-under 71 after 71-73 on first two days. She was followed by another amateur Sifat Sagoo (72-74-72). Vani Kapoor (73) had a week that she would like to forget in a hurry as she ended seventh without a single under par round on a course that yielded very good cards. Smriti Mehra (75) was eighth, with Gursimar Badwal (72) also having a disappointing week in the sixth leg. Gursmar was ninth and she also lost her lead on Order of Merit to Neha. Gursimar is now second and trails the leader by just under Rs. 40,000. Tvesa Malik is lying third. Khushi Khanijau (75) was 10th.